Please note that since I wrote this article, I have been persuaded that the argument it contains is wrong. The correct answer for the scenario as it is worded is not 1/2 but rather 1/3 (meaning that the likelihood of winning as a consequence of staying is 2/3). My challenge now is to explain that, despite this overwhelmingly popular response, the correct answer is not so obvious, that the likelihood of winning with a switch is 1/2 and that it doesn’t matter (probability wise) whether one switches or stays. First things first. I did try to provide a couple of hints, one of which was that the goats are unique entities. To highlight this, I will give the goats names. There is the pretty, pleasant natured goat called Mary (M) and there is the unattractive, unpleasant goat called Ava (A). We might not care about the names of the goat, but I think we can agree that there are two goats and these two goats are not the same goat – meaning that they are not entirely interchangeable. The car doesn’t really have a name, but just in case it feels left out, let’s call it Carmen (C). These can be thought of as being in the order of first door selected, second door selected and unselected door. If you want to suggest that you select both doors simultaneously, then you can think of the order being leftmost selected door, rightmost selected door and unselected door. It doesn’t really matter, so let’s use "leftmost" and "rightmost" in order to dispense with considerations of selection order. 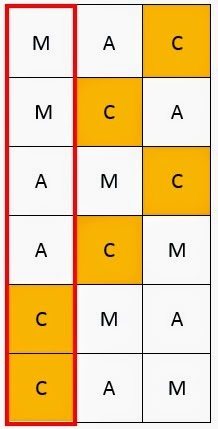 To make things clear, the cells that are boxed in red indicate the doors that you selected and I’ve highlighted the car in gold (oops, I mean Carmen!) The philosopher will never open a door with Carmen behind it. And we know that. However, we also know that the philosopher will open one of your doors such that the opened door will have one of the goats behind it. The crux of the puzzle, therefore, is to work out what the likelihood is that Carmen is behind our remaining door, after the philosopher has opened the other door. Opening the door will reveal either Mary or Ava, but not Carmen. What it will also do is wipe out the 2 out of 6 scenarios in which there was a car behind the door opened, meaning that there are only four possible scenarios left – of which two have Carmen the car behind your other door and two have her behind the door you didn't select. The conclusion, therefore, is that after the philosopher opens the door, the likelihood that Carmen the car is behind your door is 1/2 and the likelihood that she is behind the door you didn't select is 1/2. You don't improve your odds by staying and you don't improve your odds by switching. If you have the car behind your door, then Monty must select which of the two goats to reveal – if he makes that selection at random, then there is a 1/2 likelihood each time of selecting Mary and a 1/2 likelihood of selecting Ava. In this scenario, which I hope everyone now agrees is fundamentally different to the Reverse Monty Hall Problem, the likelihood of getting the car if you switch is improved, from 1/3 to 2/3. Just like most of us all already knew. Have I made an error somewhere? Clearly I have, since the correct answer is that there is a 1/3 likelihood of winning if you switch and 2/3 likelihood of winning if you stay! There are 1 million doors. Behind one is a car, behind the rest are goats (forgive me for not naming them). You select 999,999 of the doors. The host then opens up 999,998 of your doors. Do you stick with your door or do you switch to the 1 out of a million doors that you did not pick originally? When the host reveals which of your doors do not contain the car, he is collapsing the odds in favor of the car being behind the other unopened door that you originally selected. The odds are not equal between your unopened door and the unselected unopened door. It'd be much easier to do it with four doors, rather than a million. If there a trick (and I don't consider it a trick) the trick is that (3-1) = 2, so 1 / (N-1) in this case just happens to be 1 / 2. 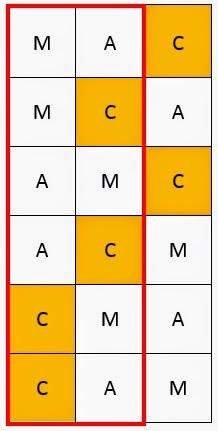 If we have four doors, and I select three, then there are 24 permutations, of which 6 are eliminated when the host opens the door, leaving you with 18 permutations. In 6 of the remaining permutations, the car is behind the door that you did not select, but in 12 of them, the car is behind your one remaining door. This means that the likelihood of benefiting from a switch is 6 / 18 = 1 / 3 = 1 /(N-1), where N=4. If N=2,000,000, if you have two million doors (or two million balls per the two balls, one urn scenario), then the relevant likelihood is 1 / (N-1) = 1 / 1,999,999. Ah, I see. I still need to consider this more, but at least the solution you arrive at isn't as obviously incorrect as I was thinking. You and I have the benefit of having come at this just after considering the "Two Balls, One Urn" scenario (and having been exposed to Travis R's input). The vast majority of people reading about this, the Reverse Monty Hall problem, are thinking only about the generalised Monty Hall problem, so the key simply isn't available to them. I think that I am going to have to write another solution - and I shall have to avoid thinking of it as the final solution (both because it's an unfortunate reference to a rather horrible episode in the history of humanity, and because it is unlikely that it will convince everyone). I don't think you're right about this. 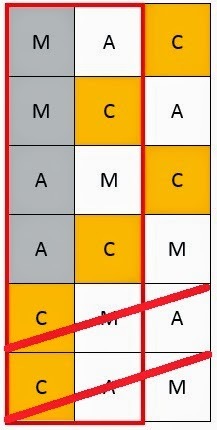 In 2 of the 6 scenarios (MAC and AMC), the philosopher can choose whether to open the rightmost or leftmost selected door because both of them contain goats. In these cases, switching wins the car. In another 2 scenarios (CMA and CAM), the philosopher has no choice but to to open the rightmost door because the other chosen door contains the car. In these cases staying wins the car. In the remaining 2 scenarios, the philosopher can only open the leftmost door because the other chosen door contains the car. In these cases staying wins the car. Therefore in 4/6 scenarios it is better to stay. If you look at your explanation, you have 4 equally weighted possibilities for if the philosopher opens the rightmost door, same for the left. . 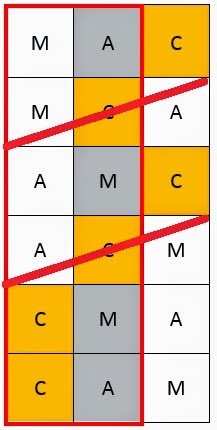 But 2 of those possibilities are shared between the 2 groups (MAC and AMC) and have a 50% of being in either, so they should have 50% of the weighting of the other 2 options in each group. There are 6 total scenarios, not 8. 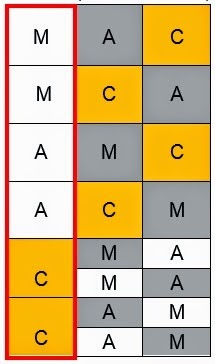 In the rightmost door group, it isn't 1/4 chance for each available option, it's 1/3 chance for CMA, 1/3 chance for CAM, 1/6 chance for MAC and 1/6 chance for AMC. That's 2/3 win chance for staying. Same for the leftmost door group. Yes, I agree that there are not eight (8) scenarios and I agree that, before the door opens, there are six (6) scenarios. But that is before the door opens.